How do you find the milongas in BA ... the teachers... the musicians... your new tango shoes... BA Tango is one of the best sources of information. 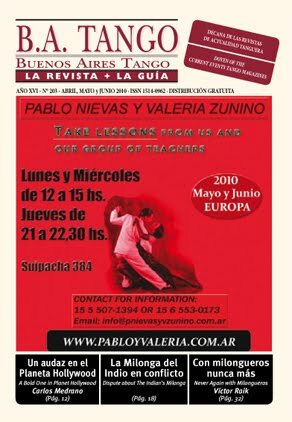 When I first went to Buenos Aires 7 years ago this was the magazine to get... and it still is very popular as the magazine in which to find out where the milongas, the dance teachers, the tango shows and the musicians are performing. You can subscribe by emailing the editor Tito Palumbo at abatango@hotmail.com.